Tsukioka Yoshitoshi’s One hundred aspects of the moon (1885-92) is the final masterpiece produced by one of the last great masters of ukiyo-e printmaking. Acquired by the Art Gallery of New South Wales in 2012 through the Yasuko Myer Bequest Fund, this is the first time that One hundred aspects of the moon will be exhibited in its entirety in Australia. One hundred aspects of the moon comprises 100 intricately detailed woodblock prints that Yoshitoshi created between 1885 and 1892. Each print is a moment in time and poetically draws from stories relating to the moon in Japanese and Chinese history, famous legends, literature and theatre, as well as folklore. The characters of these stories are diverse, from stoic warriors and samurai to everyday townspeople, courtesans and mythical characters, many expressing a reverence to the moon. Natalie Seiz, Art Gallery of NSW assistant curator of Asian art said the staging of the complete One hundred aspects of the moon is a rare opportunity to view this extraordinary series by one of the masters of the ukiyo-e genre. “Yoshitoshi was one of the most admired artists of his time and this exhibition celebrates the impressive technical skill and imaginative designs that have secured his place in art history and as one of the originators of manga and anime ,” Seiz said. Staged in the upper Asian Gallery, One hundred aspects of the moon encompasses the entire exhibition space. Half the works are displayed on freestanding easels as an evocation of the lunar cycle, allowing visitors to experience the magnitude of the entire print series in one place. In September Seiz will present a lecture on One hundred aspects of the moon and the Gallery will host a variety of ukiyo-e inspired talks and events as well artmaking workshops for families. From kitsuke (the art of kimono wearing) to irezumi (traditional Japanese tattooing) the program will consider the history and ongoing impact of ukiyo-e printmaking. 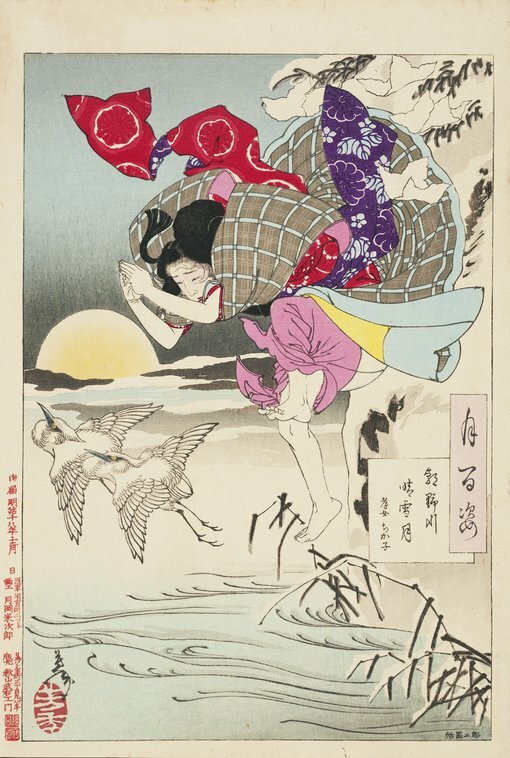 The Japan Foundation in association with the Art Gallery of NSW will present a program of talks based on Yoshitoshi’s One hundred aspects of the moon and the exhibition Perseverance: Japanese tattoo tradition in a modern world on display at the Japan Foundation Gallery from 28 September to 12 November 2016. The talks in this series look at the life and work of Yoshitoshi and explore the dynamic relationship between ukiyo-e prints and Japanese tattoos, from centuries past until today.